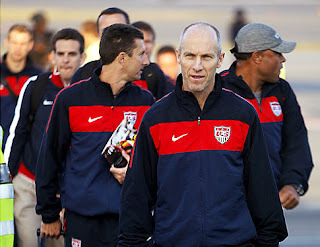 Landon Donovan, Michael Bradley, Maurice Edu, DaMarcus Beasley, Clint Dempsey, Stuart Holden, Jose Francisco Torres, Alejandro Bedoya, Benny Feilhaber. A star-studded cast. All have seen significant time in European leagues (and excelled) as well as Mexico (Torres). They are all starters in their clubs (Donovan with Everton earlier in 2010). They also score. At the World Cup. If Jozy and company failed to deliver, the midfield stepped up. Beasley may be on his way out and Ricardo Clark has seen his stardom fade after a silly mistake cost the USA Ghana's first goal in the round of 16 at this year's World Cup. The same goes for Freddy Adu and Sacha Kljestan. Incoming is German-born Jermaine Jones, recently pledged allegiance to the USA (his father is American). Jones is a regular for Shalke 04 of the German Bundesliga and featured in the youth German teams. It is quite fortuitous to have such a wide array of players in this position. It's also a bit of a hassle when it comes to choosing the best. Why? Because they are all potential starters. Would you sit out Donovan, Bradley, Dempsey or Edu? Maybe, depending on the opposing team and the situation. Adding Jones to the mix further complicates matters (for good and for bad). Jones is more of a holding midfielder with scoring capacity (much like Bradley and Edu). Unless a 4-3-2-1 Christmas Tree formation is adopted (with Jones-Bradley-Edu), one of the three will need to sit out. Add to this the attacking mids (Donovan, Dempsey, Holden, Feilhaber and Torres) and your choice for the next two will also likely depend on the game situation. It's true that we wish our attackers (especially Altidore) would start scoring, but the midfield has more than made up for it. Donova scored 3 key goals in the World Cup, with Dempsey adding the tying tally against England and Bradley playing the hero in the hard-fought 2-2 tie versus Slovenia. Oh, let's not forget the dubious call on Edu's game-winning goal that wasn't. And these guys also score for their clubs on a regular basis. Feilhaber, for example, has scored 6 goals in the past two weeks for his Danish club Aalborg. 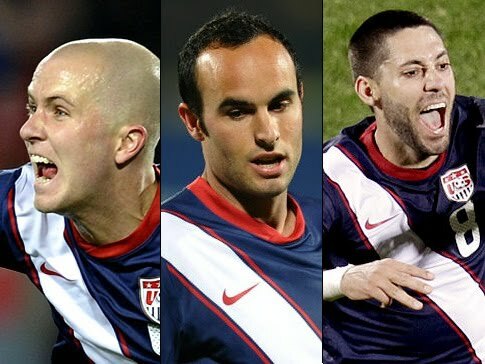 Bradley, Jones, Bedoya and Dempsey have all scored at least once in the past month. Edu has been dangerous, as has Holden. It is an interesting predicament for Bradley, especially given that only Dempsey and Donovan can be shifted to a striker role if necessary. We are at a crossroads with the national team. Player development has stalled in the striker role and the defensive techniques require some serious revision. We will have a look at Aston Villa fringe player Eric Lichaj. He, along with Tim ream and Omar Gonzales (both not available for the October friendlies) appear to be the start of a rejuvenated defense. Adding the also-young Jonathan Spector rounds up potential future starters. Onyewu is always in serious contention, as is Bornstein. Bocanegra and Cherundolo are likely to be slowly phased out. It is in our midfield that the future of the national team is brightest. Edu can also play defense if needed. But we can't rely on Donovan, Bradley and Dempsey to come to the rescue if Howard is left alone or if Altidore and the rest of the striker force is unable to crack the opposing goal. The midfield is the engine of a team but all other pieces must step up in order for the machine to work. So what is the argument against moving Dempsey to striker, he obviously has a good scoring touch and the desire to play an attack minded style. Is he not fast enough or do you feel we can't lose him from the midfield? It is partly his speed. We have decent options in the midfield now, especially if Holden continues to develop. Torres is another great option. Dempsey goes back and forth on the wing so his attacks are highly diagonal. He's great at forward, but a bit deeper, like Messi for Barca. We need a #9. Eddie Johnson is getting back on track...he's got speed and he can slide into the #9 role if he starts scoring.